The 2019 Cadillac CTS is a gradual update of the third generation design of the car that traces back five years. With these updates, however, the current CTS leaps into the future and stakes its luxury sports car claims against anything that European competitors offer. For 2019, there are five trim levels which we compare. Also included is a high-performance version of the sedan, the CTS-V. While this is technically a separate model from, not a trim of, the regular CTS sedan, it shares many of the same dimensions. The base trim of the 2019 Cadillac CTS is simply (or confusingly) titled the "CTS." At an MSRP of $47,990, the car has a 2.0L turbo 4-cylinder engine capable of 268-hp and 295 lb-ft of torque. Other mechanical features include an automatic transmission with auto stop/start. The engine also has a remote start using the integrated key fob sensor. The vehicle drives on all-season run-flat tires and 17" 10-spoke painted aluminum wheels. While the V-Sport MSRP of $62,690 is higher than that of the Premium Luxury, it's better to think of the V-Sport as more akin to the Luxury trim with sporty enhancements. For example, there are no rear heated seats in the V-Sport like there is in the Premium Luxury models. That's because the additional price point goes toward an upgraded engine. The 2019 Cadillac CTS V-Sport features a 3.6L V6 engine, similar to upgradable options on other trims. However, being the sports-focused offering, the V6 on the V-Sport is a twin turbo capable of 420 hp and 430 lb-ft of torque. That's good enough to go from 0 to 60 mph in 4.4 seconds. To complete the sports focus, the V-Sport also has magnesium paddle shifters and enhanced ZF premium steering. 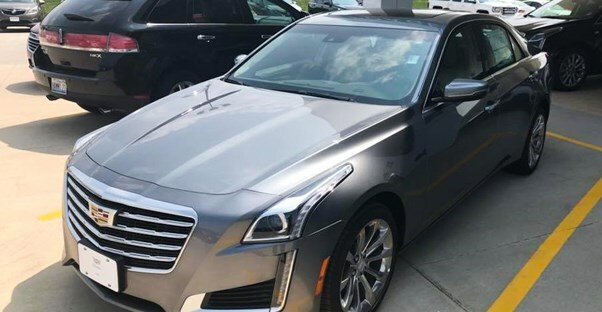 As stated before, the 2019 Cadillac CTS Premium Luxury trim is cheaper than the V-Sport while offering more features. The drop in price is mainly due to a less capable engine, a standard 3.6L V6 instead of the V-Sport's twin turbo. The Premium Luxury engine is capable of 335 horsepower and 285 pound-feet of torque. The Premium Luxury trim also loses the sporty enhancements of the V-Sport. Instead, the focus here is on refinement and comfort. Cadillac's V series is a line of high-performance models based upon the brand's regular vehicles. Technically, the V series offerings are separate models, not trims. However, we've included the CTS-V Sedan in this CTS trim comparison because it shares such similar dimensions with its comfort-focused siblings. With a starting MSRP of $87,990, the 2019 CTS-V Sedan houses a 6.2L V8 engine. This V8 engine is a hallmark of the V series and is not an available option on CTS trims. The supercharged V8 is capable of 640 horsepower. Which 2019 Buick LaCrosse Is Right for You? Which 2019 Cadillac Escalade Is Right for You? Which 2019 Chevrolet Camaro Is Right for You?